Mohamed ElBaradei interview: Egypt’s vice president on Gen. Sisi, Mohamed Morsi, and the chaos in the streets. Mohamed ElBaradei calls for reconciliation before the violence in Egypt’s streets spirals out of control. 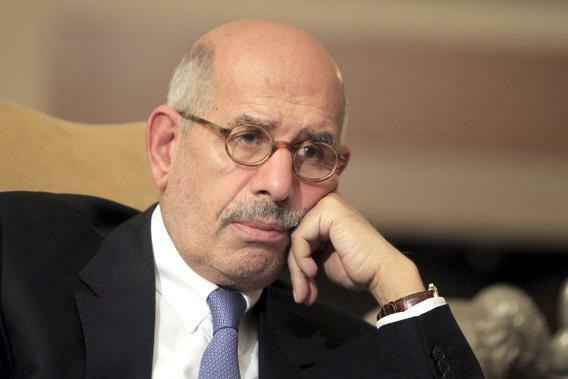 Mohamed ElBaradei is hopeful democracy can still be achieved in Egypt. Lally Weymouth: What should happen to the Muslim Brotherhood members camped out at the Rabaa al-Adawiya mosque? U.S. officials are concerned that the army will crack down and there will be more bloodshed. Mohamed ElBaradei: That’s exactly what we want to avoid. Being harsh is not a solution. Understanding what we need to do and how you achieve social inclusion and political stability is more important. There’s a lot of high emotions here and a lot of anger. That’s not where we want to go. We want to go into more acceptance of diversity of different views. That’s the only way to achieve stability. What we need to do right now No. 1, of course, is to make sure that we stop the violence. And there is a lot of violence. Once we do that, we immediately have to go into a dialogue to ensure that the Brotherhood understand that Mr. Morsi failed. But that doesn’t mean that the Brotherhood should be excluded in any way. They should continue to be part of the political process, they should continue to participate in the rewriting of the constitution, in running for parliamentary elections and presidential elections. You have the Tea Party, and you have the American Civil Liberties Union. There is a big, wide gap, but they are able to live together under the Constitution. L.W. : So members of the Muslim Brotherhood have to understand that Morsi failed but they should be able to run for office? M.E.B. : Morsi failed not because he is a member of the Brotherhood but because he failed to deliver. In a democracy, when you get 20 million people in the street, you resign. Unfortunately, we don’t have a process of recall or impeachment like you have. It was a popular uprising rejecting Mr. Morsi’s continuing in power. Unfortunately, people had to call on the army to intervene. The army had to intervene because short of that, we would have ended up in a civil war. People went to the street on the 30th of June and were not psychologically ready to go home until Morsi left office. Either it would have continued, with all the bloodshed that would have come with it, or Mr. Morsi had to leave. It would have been ideal for Mr. Morsi to resign, but he didn’t. So you have this esoteric discussion, whether this is a coup d’état. When you have 20 million people calling on Mr. Morsi to leave, and the army had to step in to avoid a civil war, does that make it a coup d’état? Of course not. It’s not your classical army intervention. It’s really the army providing support to a popular uprising. It was no different than what happened under [former president Hosni] Mubarak, except this time you had the Brotherhood and the Salafis—you had a country much more divided than during Mubarak’s time, when he didn’t have much support other than his apparatchiks. So they had to come in. But nobody wants to see the army back. The army itself understands that they cannot govern, they are unable to govern, and people don’t want them to govern. L.W. : Do you see Gen. [Abdel Fattah] al-Sisi? M.E.B. : I talk to him all the time. … This is a country with a lot of anger and irrational feelings, and we need to cool things down. The army has a role to play in protecting national security. But we the people need to make sure this is a transition to move towards democracy. We need to make sure we have a civilian president, a vice president, a government, and that they are in charge. We also need to make sure there is a proper division of labor between what the army has to do and between governance, which has to continue to rest with civilians. We need to make that transition right this time. As you remember, from Day 1, I thought we were heading in the wrong direction because we didn’t have a constitution at the beginning. L.W. : So you thought it was wrong to have elections before writing a constitution? M.E.B. : Absolutely. If you look at my tweets, you will see from Day 1 I said we were heading in the wrong direction because you need to start with a constitution. This time we are starting with the constitution. We already have a committee of legal experts working on proposing amendments. We are going to have a constituent assembly of 50 people who we are going to select from all walks of life. Then we will go for parliamentary and presidential elections. I hope this whole process will be no more than nine months to a year. Then people will see we really want to move into a democracy. Whether we are going to have a perfect democracy—of course not. You don’t have it even in the U.S. And we are coming from five decades of a total authoritarian government. We are on occasion making mistakes, having hiccups on the road, as you saw a couple months ago, but we have to make corrections and move forward. Do we need democracy? Absolutely. Is democracy the way to go? Absolutely. Will a democratic Egypt have a tremendous positive impact on the Arab world and the region? Absolutely. L.W. : Are you going to run for president? M.E.B. : No, my role will have been completed to put the country on the right track. I think I will have done what I can do, and a change of generation is needed here. I would like to continue to be a coach, rather than an active player, after we move through the transition period. M.E.B. : Morsi is in a place to protect him. There are charges levied against him. I think once we get the violence down and start a dialogue, a lot of these things could be checked. We aren’t going to intervene with a court order, but there is a lot of room to see how we deal with possibly a safe exit for all the Muslim Brotherhood leadership who are not really involved in serious crimes. L.W. : So there could be a safe exit for some Muslim Brothers? M.E.B. : This is on the table. L.W. : Where would they go? M.E.B. : Whether they want to be here or go out of the country—these are issues to be discussed. [European Union representative] Catherine Ashton went to see [Morsi], and she said he’s in good health. L.W. : Do you think that Nelson Mandela set a great example with reconciliation—his idea of forgive but don’t forget? M.E.B. : If you ask me, forgetting and forgiving is what I would opt for. I’m not running the country, but I would definitely argue for forgiveness once we move forward. Tolerance. South Africa is a perfect example. L.W. : You would like to see a pardon of the charges against Morsi? M.E.B. : If they are not very serious, I would like to see a possible pardon as a part of a grand package. Because the fate of the country is much more important. L.W. : People seem extremely angry—at Morsi, at the United States. M.E.B. : Everybody is angry—we have 90 million people who are angry. Everybody thinks they have the solution. They are talking at each other, not to each other. We had a revolution two years ago, and we see a people moving from a completely authoritarian system into a democracy. They don’t know how democracy works. They don’t know the ingredients of a democracy. It takes time. There were a lot of expectations after the revolution—even unrealistic expectations, in many cases—that salaries would be doubled. None of that took place because of course you have a country that is ailing in many ways. M.E.B. : Financially, economically, socially—in every respect. The gap between the rich and the poor, the poverty level, illiteracy—all of that is still there. What we need is anger management right now. Part of that is to lower the temperature in terms of violence and then have a dialogue. And once people start talking to each other, they will understand that this demonization of each other is just in their minds and not based in reality. I don’t want to get into a witch-hunt situation. That’s not where we should go. The last year was very bad. Mr. Morsi adopted a policy of exclusion. That backlash that you see right now is people saying, “We have been treated unfairly politically, economically, socially.” He tried to impose social values that aren’t sitting well with the majority of Egyptians, such as his own version of Islam, which is not shared by the majority of Muslims. The reaction right now is just anger. We tried to get even. But we shouldn’t try to get even—we should try to reconcile. L.W. : Who is the government’s main contact with the Muslim Brotherhood? M.E.B. : There hasn’t been an organized dialogue between them and the government. There’s a lot at the civil-society level. But once the violence is out of the way, we’d like to get some dialogue. I’d be happy to do it myself. I talked to the North Koreans—I should be able to talk to the Muslim Brotherhood. I believe in dialogue. That’s the only way to move forward. L.W. : What do you think about the anti-American sentiment that is so prevalent in Cairo? M.E.B. : Again, this is part of the anger. Some of it is justified, a lot of it is not justified. There is a conspiracy theory that Americans propped up the Muslim Brotherhood. … America is always a good target for a populist. In many countries, particularly authoritarian systems, if you want to get an extra bonus, you bash the Americans. Mr. Morsi was democratically elected. It was an opportunity for the U.S. to reconcile with political Islam. … If I were American, I would have done the same. The problem is that the Brotherhood failed miserably. L.W. : The Saudis and the United Arab Emirates gave a huge amount of money to Egypt after Morsi left. M.E.B. : They were so happy to be rid of them because for them, [the Muslim Brotherhood] was an imminent danger. And as a result, they are spraying money at us. Which is great. But again, we need to make sure things cool down here so we can use the money to jump-start the economy. It’s good to get that money. But what I really care about is to make sure we get foreign direct investment and the tourists back. In my view, our problem No. 1, 2, and 3 is economic development. L.W. : How in charge is the interim government? Do you have to consult with the army all the time? M.E.B. : We have to consult with the army when there is a national security issue, when there is a demonstration. But in terms of economic plans, negotiating with the IMF [International Monetary Fund], for example—no. L.W. : Are you going to do that? M.E.B. : We have to do it. I hope to do it. I think the government wants to do it because we need that certificate of creditworthiness. We have that money coming to us from the gulf. We do not want the IMF because of the $4 billion. We need the IMF as a certificate that the economy is healthy so we can get foreign direct investment. I personally believe we should do it as soon as things start to stabilize here. L.W. : How many people are unemployed? M.E.B. : Three million unemployed. Young people. What do you do with them? This is a real issue for us. L.W. : You turned down ministerial portfolios in the past few years. Why did you accept now? M.E.B. : Because I think the country is falling apart. And I think the youth who staged this uprising wanted me to step in and be in charge. They wanted me to be the prime minister with full authority. I think there was a consensus of the secular parties and the youth, the 20 million who went to the street. I could not say no at a time when the country was falling apart. I would have to give it my all. L.W. : As vice president, what are your duties? M.E.B. : My duties are international relations, which is all-encompassing. I need to look into investment policies, foreign policies, and make sure we get back into a normal relationship with the rest of the world—the gulf in particular, the U.S., and Europe. I want to make sure that investment is coming back. I’m also working on the democratic transition and on the criteria for selecting the constituent assembly with the president and the prime minister. L.W. : The constituent assembly will draft the constitution? M.E.B. : Yes, it’s going to draft the constitution. I want to be engaged in a dialogue with the Brotherhood and the Salafis to make sure that everyone is on board. L.W. : What about Egypt’s relationship with Israel? M.E.B. : Again, this is now a democracy. We need to make sure that there is really a real peace with the Israelis. They have an opportunity, frankly, right now. In the past, they had peace with Mubarak, not with the Egyptians. Now is an opportunity for them, and I hope they grab that opportunity to have a peace with the Egyptians. But that requires that they make certain major adjustments to their policy with the Palestinians. L.W. : So you’d like to see a positive outcome of Secretary of State John Kerry’s talks? M.E.B. : Absolutely. Kerry’s talks are based on a two-state solution and all the basic pillars of Bill Clinton’s outline done in the last week of his presidency. Once we get that, then I think the road is open for normalization of relations with Israelis and a comprehensive peace in the region. L.W. : Could the army coax the Brotherhood to leave the Rabaa al-Adawiya mosque and Cairo University? M.E.B. : Ideally, we need to get them out through dialogue. Ideally, that should completely stop violence. As I said, I do not want to see any more bloodshed. Nobody wants that. We are doing our best. That’s why [I favor] a dialogue renouncing violence as part of a package for them to disband this whole demonstration and then start building the country. L.W. : But they need to cooperate? M.E.B. : They need to cooperate. But they need of course to feel secure, they need immunity, they need to feel that they are not excluded. It’s things we are willing to provide. L.W. : Do you have to restore law and order? M.E.B. : We have to restore law and order eventually. We are in a race against time. People are very angry. People are very angry with me because I am saying, “Let’s take time, let’s talk to them.” The mood right now is, “Let’s crush them, let’s not talk to them.” That would last for one week, and then they would come back. It would be a disaster everywhere, inside Egypt and outside Egypt. We need to get a long-range view based on restoring order and based on national consensus and reconciliation. I hope the Brotherhood understands that time is not on their side. I’m holding the fort, but I can’t hold it for very long. L.W. : Are you a single voice on this subject? M.E.B. : No, I’m not a single voice at all. A lot of people understand that, but we are not the majority. L.W. : Do you think last Saturday [when 72 people were killed as Egyptian security forces stormed a pro-Morsi demonstration] was a mistake? M.E.B. : Last Saturday was terrible. I called for an independent commission. Anything that involves losing lives is a horrible mistake. Whoever started it, whether it was excessive use of retaliation—I don’t know. But we need to make sure this will not be repeated. This is our immediate priority right now. Stop violence and go back to the table and start talking and find a solution. We are condemned to live together. L.W. : And you think it’s possible? M.E.B. : Otherwise I would not be here. We don’t have other options. L.W. : Does Gen. Sisi share your view? M.E.B. : He does. He understands that there has to be a political solution. But of course he has a responsibility to protect the country in terms of security. And the army is on the edge. L.W. : Is he going to run for president? His picture is all over Cairo. M.E.B. : You see Sisi’s picture everywhere, and it’s good that he is not thinking of running for president. It’s good that he does not want to have the army run the country. But people in a national emergency look for power, and the power rests with the army right now. L.W. : Did you know Morsi would go? M.E.B. : I knew he would go. L.W. : Did you have inside information? M.E.B. : No, it was just my gut feeling from talking to all these angry young Egyptians. Everybody went to the street, and they were not ready to come back until Morsi went. And I think it was good he went the way he went because we saved a lot of lives. The army intervention was simply to avert a civil war. L.W. : You feel the army had to intervene? M.E.B. : They had no choice, the army. There would have been a lot of wrath against them. It’s their national duty to protect national security. It’s a very peculiar situation. Sissi until yesterday was telling me: “I wish Morsi would have succeeded. I wish Morsi would have listened to us.” They talked to him three or four times before he left, the chief of staff of the army, telling him he had to make a lot of corrections. He had to be more inclusive. That he had to fix the economy. That he had to continue to listen to the people. They told him what every one of us was seeing—that the country was falling apart. He didn’t listen. L.W. : But Sisi said to you he wished Morsi listened? M.E.B. : Yes, he keeps saying he wished that Morsi would have succeeded, he wished they didn’t have to do what they have done. So it’s not that there is glee on his face that they had to do that. This is the most crucial period in Egypt for a long time. You asked why I stepped in? Because I do not want to see the country where I grew up falling apart. It’s not easy because there’s a lot of anger. It’s not people listening to the voice of reason. You want people to understand that yes, we have our ideological differences. Yes, Morsi had to be removed from power. There are billionaires and 40 million people who live under $2 a day. We have one-third of the country who are illiterate. We have a lot of ills, socially and economically. But put all that in the melting pot, we have to find a recipe to live together. Because we have no other option other than to implode.